Item: LYA1259 - Storage clipboard box with calculator. Item Size: 15.5" long, 10" wide, 1.25" deep. Holds over 30 forms up to 9" x 11.5" in size. Heavy duty front clip with plastic edges to keep documents secure. Built in handle with secure snap lock. Smooth exterior surface for writing. Inside section to hold pens, pencils, etc. Packing: 12 pcs/ctn/31 lbs., poly bag. Setup Charge: $40.00 per color / location. Price includes 1-color imprint. Additional colors are $0.40 per color / location. Minimum imprinted order is 25 pieces with a $40.00 less than minumum fee. Clipboard Samples Available Upon Request. Additional Imprint Color Pricing will not be listed in shopping cart totals. * We reserve the right at any time to correct any errors in pricing or descriptions. Product and service prices and specifications are subject to change without notice. 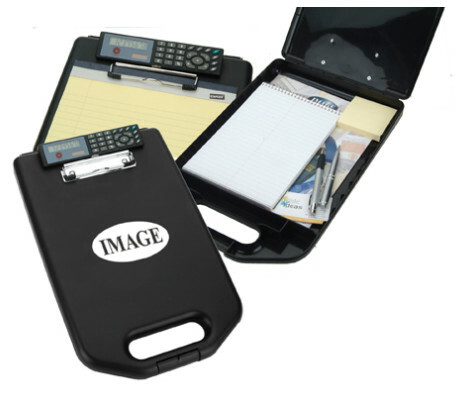 Clipboards & Padfolios for work, school, sports & promotions.